Coaxial vs Component Speakers: Which One to Choose? →Coaxial vs Component Speakers: Which One to Choose? Car speaker manufacturers make different speaker models aiming at satisfying the diverse preferences of every user. 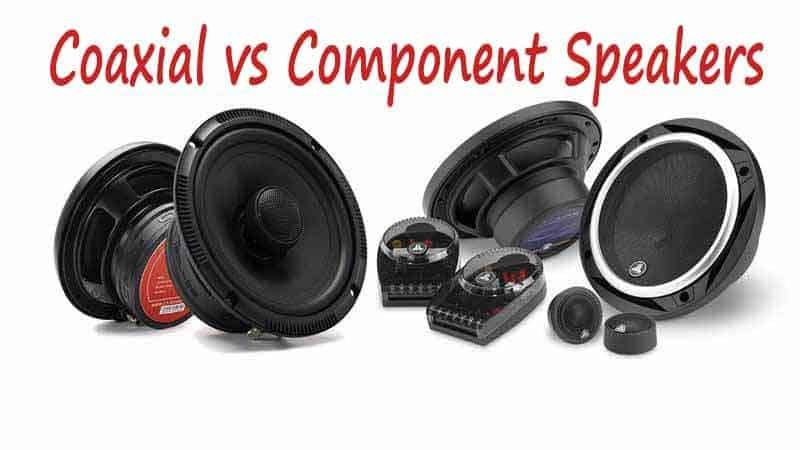 Having extensive experience in the car audio equipment industry, we have known that generalizations about which speakers are better than others are a bit misleading. We believe that getting the best speakers for your car depends on how well you define your requirements and then choose a speaker that best matches them. Whether to go for coaxial or component or speakers is one of the major considerations you have to make when buying car speakers. As such, it’s important to have a good background of each of these speaker types. This article presents a simple and relatively more practical comparison of coaxial and component and elaborates on which type is better in different circumstances. You have definitely seen and experienced coaxial car speakers. First, most factory car audio systems consist of coaxial speakers. Secondly, coaxials are more common than components for reasons you will know in a few minutes. Coaxial speakers are simply car speaker systems in which all the components are combined in one structure. Often, the framework will consist of a woofer and a tweeter attached somewhere on the top or on a pole running across the middle of the woofer. Most coaxials have simple, in-built crossovers. View component car speakers as a system with separate drivers. This means you can install different drivers (components) at various locations in your car. What are you looking for in a speaker system? If you want to install speakers that will really enhance your listening experience, consider component speakers. Component car speakers have been lauded by many users for better sound reproduction thanks to separate drivers. They are able to accurately separate different frequencies across the spectrum. You get a powerful and more precise bass from the woofer, and the tweeter(s) send to your ears great high frequencies so that you can enjoy listening to vocals. Components excel at sound imaging – a crucial aspect of sound reproduction that assures you high-quality sound. This is especially facilitated by the separate, mountable tweeters. Most people like placing tweeters near ear level for it makes the sound seem like it’s coming from the dash. This is an absolutely fantastic experience you don’t want to miss if all you want is better sound quality. Coaxial speakers aren’t that great in stereo imaging. Although they can handle all the frequencies in the spectrum, you may experience frequency interference. This is a result of sound drivers being too close to each other. If you are building a custom car audio system, component speakers are a better option. Their advanced design gives you an opportunity to achieve optimal sound quality by installing different drivers wherever you like. A typical component car speaker system with consist of 2 woofers, 2 tweeters and 2 crossovers. Some have extra drivers like sub woofers which are also called mid-range drivers. An even more advanced design will include super-tweeters for better sound quality. With these drivers, you can achieve on-axis and off-axis response. Place the speakers facing the listener and you achieve on-axis response and better higher frequencies. Should you be a bass lover, let the speakers face away from the listener and enjoy off-axis response. Have you been wondering why subwoofers sound better from behind? No you know the trick: off-axis response. Coaxial speakers won’t give you much freedom to determine how your stereo upgrade performs and looks like after installation. They fit in many car models and will offer you a good sonic upgradebut that’s it. So, when it comes to customization, components beat coaxials fair and square. But what’s the price you pay for all this freedom? We’ve now come to where your effort is needed. How good are you at car audio equipment installations? If you want to enjoy all the benefits of component speakers, you either need to have reliable technical skills or be prepared to spend a few more dollars to pay for installation. You can find components that allow you to easily mount the tweeter at the center of the woofer and in that case installation is less of an issue. However, if you intend to mount drivers at different positions then you have to employ a great deal of installation skills. With coaxial speakers, installation is simple and fast. Anyone can install these speakers within a few minutes when they have the right tools. You only have one input connection to handle unlike in components where you will need to take care of three connections and three sets of speaker wires. If you cannot install a pair of speakers and do not want to pay for installation, just go for coaxial speakers and look for models that are built strongly. You will have a less stressful upgrade for your factory system and start enjoying music of better quality. Coaxial speakers generally carry a smaller price tag compared to components. If you’re working on a strict budget, there are two major reasons why you would want to stick to coaxial speakers. One, coaxials are built with time, cost and space savings as a priority. Their design combines everything together to cut down on the cost of everything including material and as we’ve just seen, installation is simple doesn’t necessarily need you to pay for expert help. The construction of component speakers definitely needs more materials and time. The extra cost is passed down to the consumer, and that is why you pay more for these speaker types. The second reason is that coaxial speakers run just fine without amplifiers. It’s a different story with components. If you want to get the most from your upgrade, you have to add an amplifier to the system to provide the component speakers with more power. v. What fits your vehicle? Don’t forget that your car also has a say in the selection process. Most coaxial speakers are designed to fit exactly in the spaces left by outgoing OEM or factory speakers. This is one of the major reasons why coaxials are more common than component speakers. Component speakers may not fit all car models because of their space and installation requirements. You will need to do more research beforehand to know which component speakers fit your car. If the car has only one speaker per door panel, you’d better opt for coaxial speakers. Most listeners find high-end coaxial speakers sufficient. People with a bigger appetite for bass, mostly audiophiles prefer an advanced car speaker system comprising of components speakers.